The award comes with the original Heritage invoice and paperwork. ABBA The Album CRIA Gold Record Award (Atlantic 19164, 1977). Originally released in 1976 as their fifth studio album, this LP contained two major hits: “Take a Chance on Me” and “The Name of the Game”. According to the plaque beneath the gold disc, this award was “Presented to ABBA to commemorate the sale of over 50,000 units of the WEA Music Album’The Album’ August 1979″. The Canadian Recording Industry Association (now named Music Canada) is the non-profit trade organization that represents the interests of companies involved in recorded music, similar to the RIAA in America. A small Canadian flag is mounted at upper left inside the frame. Framed to an overall 16.25″ x 20.25″. A few minor scuffs on the frame, otherwise Excellent. 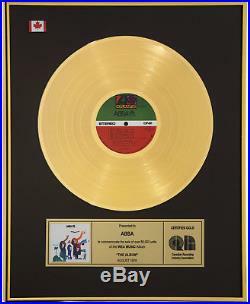 The item “ABBA THE ALBUM Canadian CRIA Gold Record Award” is in sale since Monday, September 3, 2018. 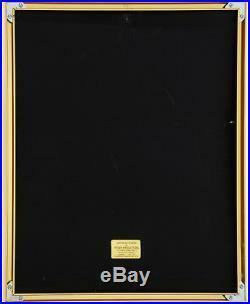 This item is in the category “Entertainment Memorabilia\Music Memorabilia\Rock & Pop\Artists A\ABBA”. The seller is “propworldinc.” and is located in staffanstorp. This item can be shipped worldwide.